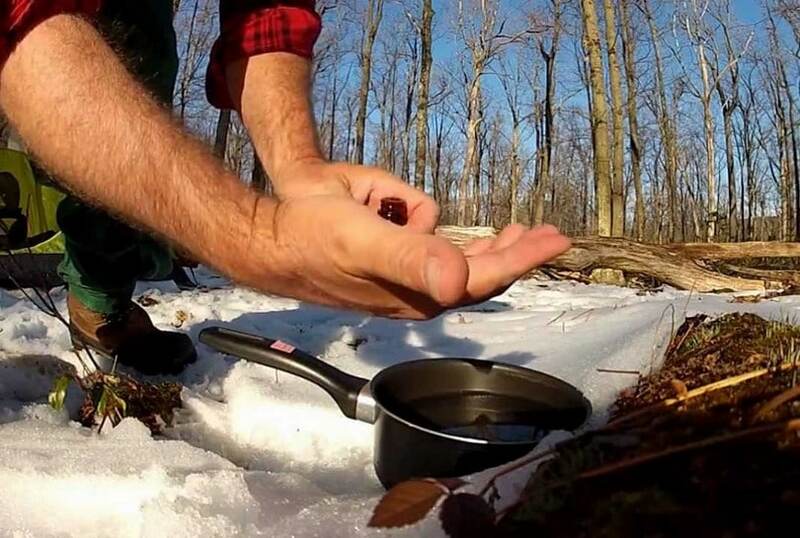 Wandering in the wilderness may eventually leave you without any safe water stores and you will have to use what nature gives you – water from streams, rivers, lakes, etc. As much as this sounds great (you’ll be drinking water straight from nature! ), it brings dangers in the face of germs, viruses, bacteria and other impurities. You will quickly realize that drinking straight from the river may actually not be such a good idea. You can use fire or heat source to boil the water and thus kill bacteria, but that may not be true about some viruses. It’s true that boiling has been used for centuries when it comes to disinfecting the water, but today there are other methods of achieving the same effect. Many of them are harmless in the long run and some of them are purifying and filtering systems, chemical solutions, water distilling systems, etc. 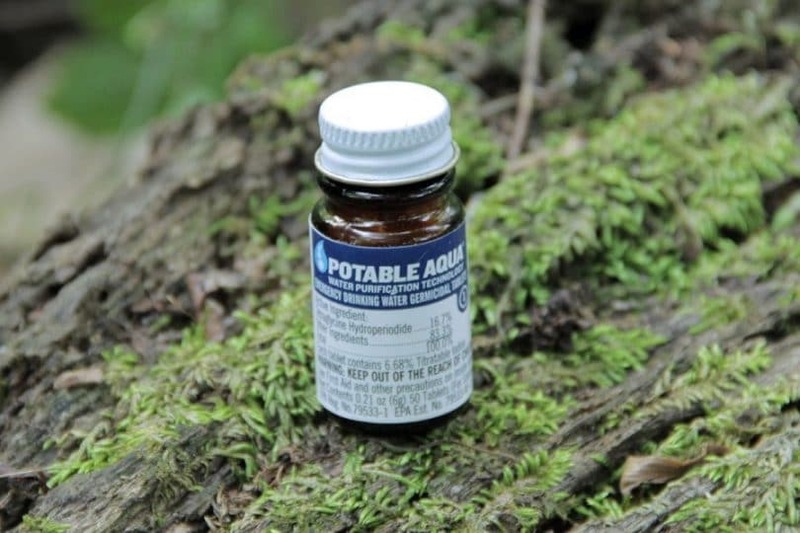 In this article we will focus on the water purification tablets, used by many survivalists, campers and hikers. They give you the option to just pop a tablet in the water container and wait for a while for it to work. After about 30 minutes you’ll have clean water, safe to drink. There are several popular methods for clearing the water using specific chemical tablets. Iodine is often used in combination with other chemicals. There are tablets containing tetraglycine hydroperiodide. This helps kill most of the existing pathogens and protozoa in the water, but it’s not perfect. It’s also true that it helps reduce the radioactive iodine in the human body, thus it’s good for nuclear disaster situations when there’s high alert for radioactivity in the contaminated area. It is also advisable that after you let the iodine tablet work, you can then pop in a vitamin C tablet to neutralize the taste of the water. It is important to note that you shouldn’t do so, soon after you used an iodine tablet. Basically, let it work for about 30 minutes (in warm and relatively clean water) or more (for cold and dirtier water). After that you can use an effervescent vitamin C tablet to make the taste more appealing. Another iodine variation to the above is the use of iodine crystals. You can use about 7 grams (0.25 ounces) of crystals in a small bottle (of about 1 ounce) and then shake well to help the crystals dissolve and work. If the water is relatively warm (about 25 degrees C/77 degrees F) the water will be safe to drink within 15 to 20 minutes. In case the water is colder, allow it to stay a bit more – 30 minutes. In the water is cold you may have to aware that some cysts may not killed (like Giardia cysts), so it’s highly advisable to pre-warm the water before using the iodine crystals. Of course, do not consume these crystals in non-dissolved form, as they can be deadly. Otherwise, unlike the tetraglycine hydrperiodide, iodine crystals have almost endless shelf life as long as they are not exposed to air. They must be carefully sealed and protected from air in glass bottles. 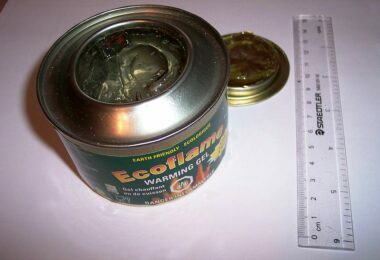 Keep in mind that storing them in plastic bottle will let iodine fumes to escape the plastic barrier and can damage nearby steel materials, spoons, kitchen utilities, cookware, etc. When the bottle is opened, it should be used within 3 months. If unopened, its life can be virtually endless. 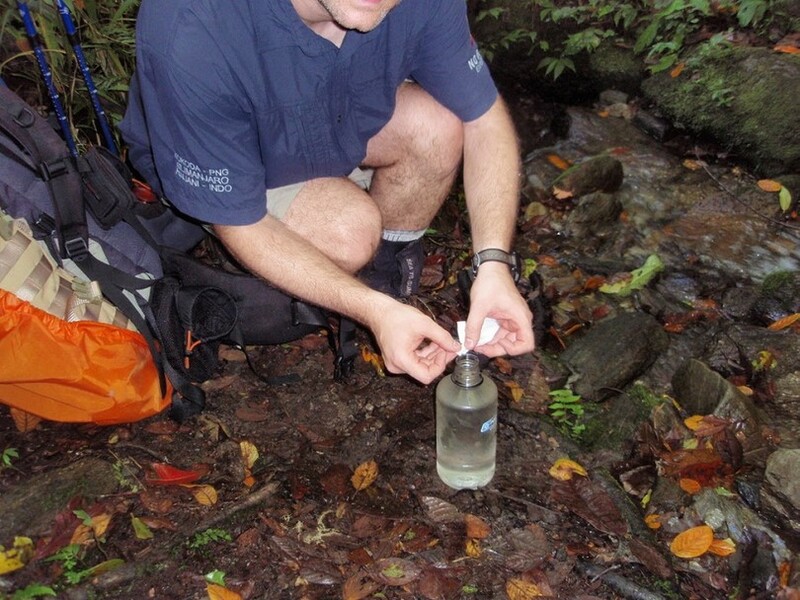 Another way to purify water through the use of tablets is with the halazone tablets. They are based on chlorine. Since chlorine is much more effective against E.coli bacteria, they are also widely used in low-hygienic areas and populations. Iodine tablets can’t successfully fight E.coli. The only downside to the chlorine-based tablets is that when they are opened they must be used within days (max 3 days). Later technology is the sodium dichloroisocyanurate, and it can almost entirely replace the use of halazone tablets. Chlorine bleach tablets are also widely used as a good alternative to the above. They have to be used sparingly and are good for long-term use. Use a 5% solution (unscented) and 2 drops per liter would work. Let it work for at least 30 minutes, and up to 1 hour. And a final note on these various methods is the recent invention of silver ion, chloride-dioxide based tablets. They can be very effective against Giardia and Cryptosporidum, but the only downside to these tablets is that silver may accumulate in certain body tissues and cause argyria (changing the regular color of some body parts to grey). If you ever decide to use the ion silver tablets, do it rarely and only if nothing else can be used instead. Also, you may have to wait longer to have the water ready to drink (up to 4 hours). The online and stationary stores offer a wide variety of water purifying products. You may get confused as to which are better than which and how to purchase the one suitable for your needs. 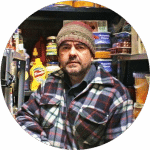 To avoid the confusion and help you make a decision we will discuss some of the most popular and valued products on the online market. This product uses iodine crystals (crystalline iodine as the active ingredient). The product claims to kill viruses, bacteria, and protozoa. It also ensures that when the iodine does its work there will not be any unpleasant aftertaste, like with some other products. 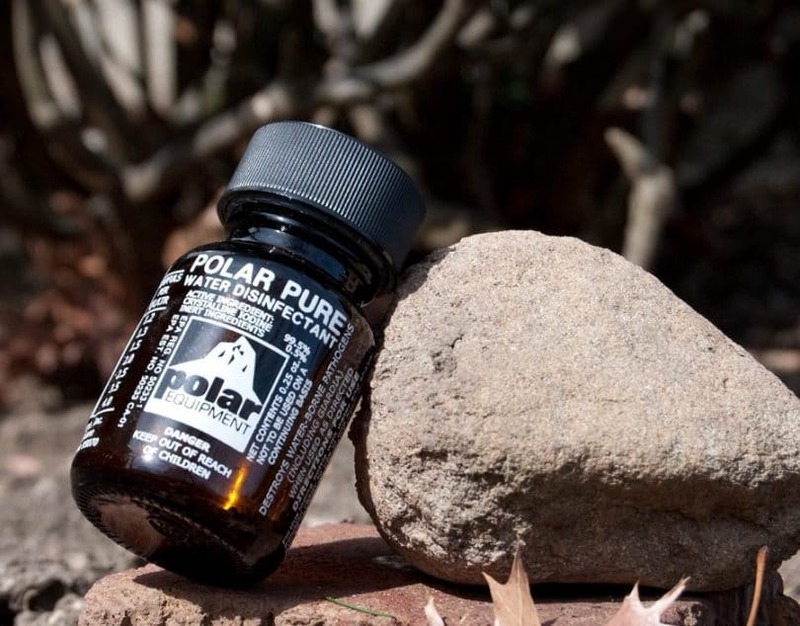 Polar Pure’s products also last for a very long time. Some users claim that their crystals, even after 10 or more years, are effectively usable and work just fine. You have to keep in mind though that these purifying tablets don’t clean or filter the sediments and particles in the water, so if you purify water that has too much dirt in it, it’s advisable to use in addition a filtering system. This will further cleanse the water and filter what’s left after using the crystal iodine tablets. In addition, Polar Pure’s product offers a liquid solution inside, which lasts much longer than the tablet form. The bottle has particle blockage, which stops the crystals inside from dropping into the water. Otherwise, the bottle has both a liquid solution and crystals for better purification. It also has a thermostat to measure the temperature, which customers find very useful. The entire bottle can treat overall 2000 quarts of water (about 1892.70 liters), while the whole bottle is only 5 ounces (141.75 grams). So, to treat one liter of water (about a quart) you have to use not more than 0.07 grams. This is about 2 drops per liter. If you are unsure about the amount you should use, you can consult the bottle for the appropriate dosage. 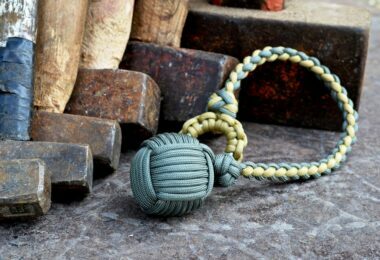 This is another popular manufacturer and it’s trusted among customers. This product offers two bottles – one purifies the water using iodine tablets (tetraglycine hydroperiodide) and the other PA+Plus bottle removes the aftertaste of iodine. So, if you dislike the iodine taste, by all means, use the PA bottle. The PA+Plus tablets are actually based on ascorbic acid (vitamin C) so they are harmless. They neutralize the effect of iodine and render the chemical useless. All within about 3 minutes. This is why you should use the PA tablets only after 30-35 minutes of use so you let the solution work. For every iodine tablet one PA tablet is enough. Each bottle offers 50 tablets and all of them can purify 25 quarts/liters of water. Some customers believe the price is slightly higher for the amount the product offers, but all of them are satisfied with the purifying properties of these tablets. Otherwise, the quality of the product is also high and most customers highly recommend purchasing Potable Aqua tablets. You can pop a tablet and within 35 minutes your water will be ready to drink. Of course, you are advised not to use these tablets on a regular basis. 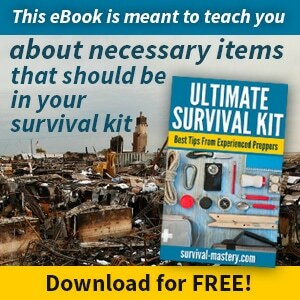 It is after all a chemical solution and should be used only rarely – when you go camping/hiking. Katadyn is a trusted brand among hikers and campers. They produce not only tablets but also other filtering and purifying systems and are among the top brands on the market. One tablet from this product treats effectively 1 liter of water. It is effective against germs, viruses, harmful bacteria, etc. It also needs to work about 30 minutes after you pop a tablet in the water. In case the water is much dirtier than a normal river water, you may have to leave the tablets to work for up to 4 hours. The product doesn’t leave any unpleasant aftertaste. It is also officially registered with EPA as an effective antimicrobial purifier. The active ingredient in this product is chlorine dioxide. It treats Giadria and Cryptosporidium cysts, but keep in mind that to treat either of these two, the tablets need to work different amount of time. For Giadria let the tablets work for 30 minutes. On the other hand, Cryptosporidium cysts are much harder to kill, so the tablets should work up to 4 hours. Plan carefully your camping area/hiking route and make a research on the water sources in these areas. 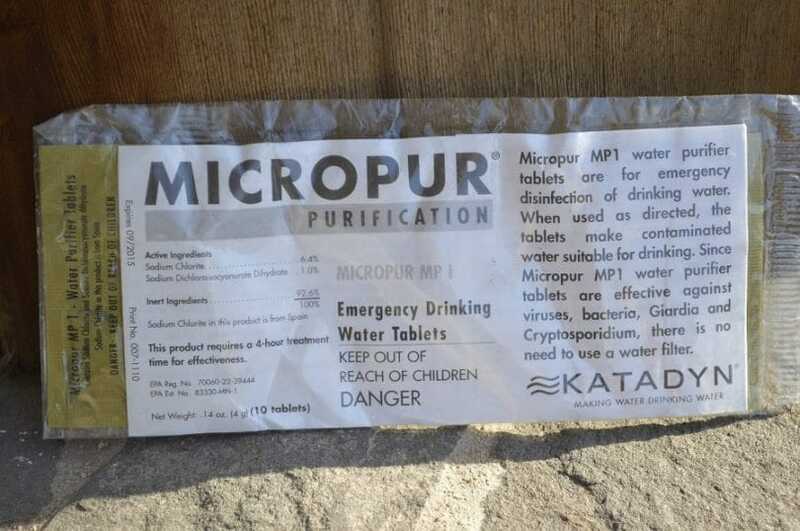 If they contain Cryptosporidium, plan that as well and always treat the water will these Katadyn tablets even if you don’t plan on drinking the water immediately. AquaMira is also a notable brand among other competitors in the field of purifying tablets and solutions. This product is also registered with EPA and kills Giadria and Cryptosporidium just like Katadyn’s product. It also takes 4 hours for Cryptosporidium to be killed and render the water ready to drink, which is somewhat a downside, according to customer reviews. Otherwise, if you plan ahead, you can be sure to drink perfectly safe water after 4 hours. The active ingredients are sodium chlorite and sodium dichloroisocyanurate dihydrate. This will make a chlorine dioxide, which is a very potent oxidant and makes sure to render the environment for bacteria, E.coli, etc. virtually impossible to survive. Chlorine dioxide is also much more powerful than other solutions (e.g. iodine) as it removes colorations, odor and unpleasant taste from the treated water. In addition, each tablet is sealed in its own compartment so you don’t have to worry about expiration date after opening the container (a problem if the tablets are in a bottle). 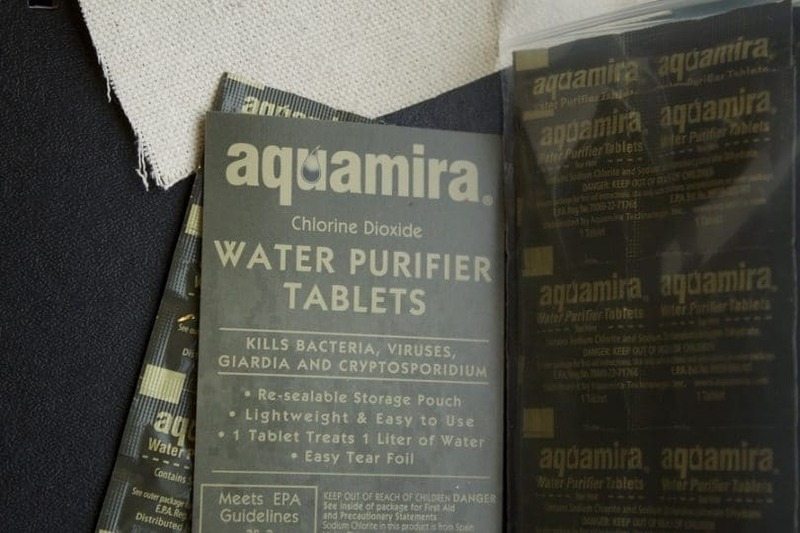 Another similar product, again by AquaMira is the AquaMira Chlorine Dioxide tablets.They also use the chlorine dioxide as the active ingredient in the purification process, so you may also consider this one as part of your backpack contents. Prepare one tablet per liter. The tablets are again packed individually, so no worries when it comes to expiration date. Each unopened tablet has a shelf life of up to 3-4 years. 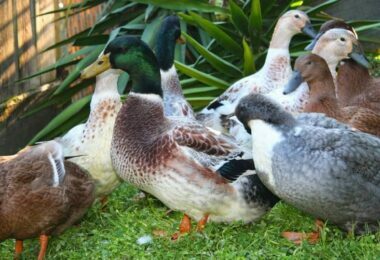 These are also EPA registered. The guidelines state that cold water should be left to the treatment up to 4 hours (for cysts), while if the water is warm (about 21 degrees C), cysts can be neutralized much quicker (for 30 minutes). These tablets are much more effective when it comes the amount of water one tablet can purify. So, one tablet is used for up to 2 liters of water, which is one of the best sides of the Aquatabs. Not only that but they also destroy all the above-mentioned germs, bacteria and viruses. These tablets are also used on the field by NATO, the World Health Organization, Red Cross and many other international health organizations. In addition to the above, they have a shelf life of about 1 year as stated on the package. The water doesn’t have any bad taste or odor after treated with Aquatabs. The water is ready to drink within 30 minutes. These tablets also are capable of removing impurities, which the iodine tablets can’t. 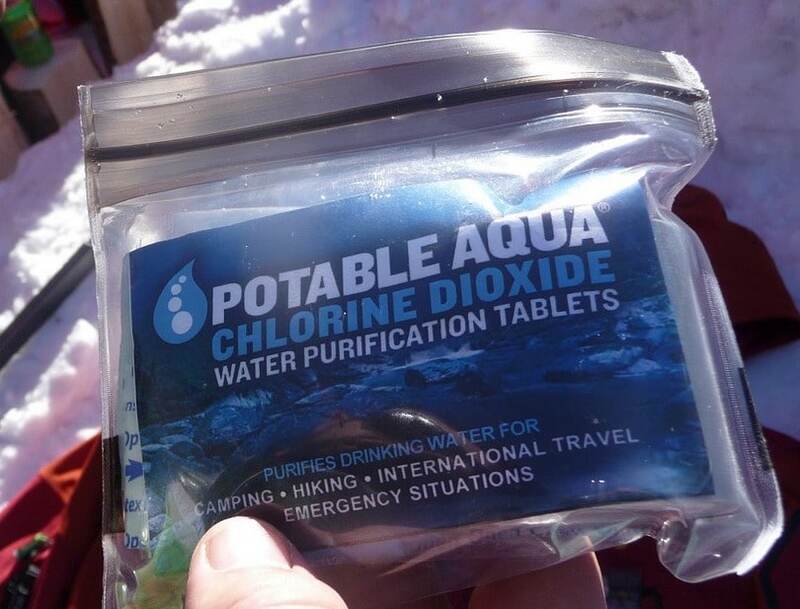 Many people going to mountain expeditions to other continents use Aquatabs and are pleased with the result, as they didn’t catch any unpleasant disease, didn’t have diarrhea or other stomach issues. 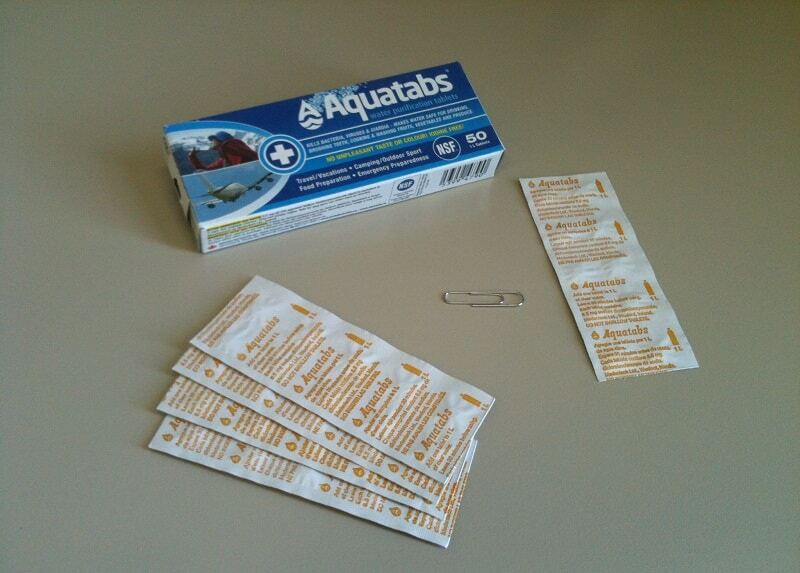 Aquatabs warn though that if the water is too dirty and visibly murky, these tablets may not be as effective. Since bacteria and protozoa ‘hide’ within the dirt particles and organic matter, you are highly advised to first filter the water. If you don’t have a filtering system, you can use a t-shirt or other cloth to filter the impurities. Then, you are safe to use the tablets. As long as there isn’t too much organic matter in the water, the tablets should work as designated. 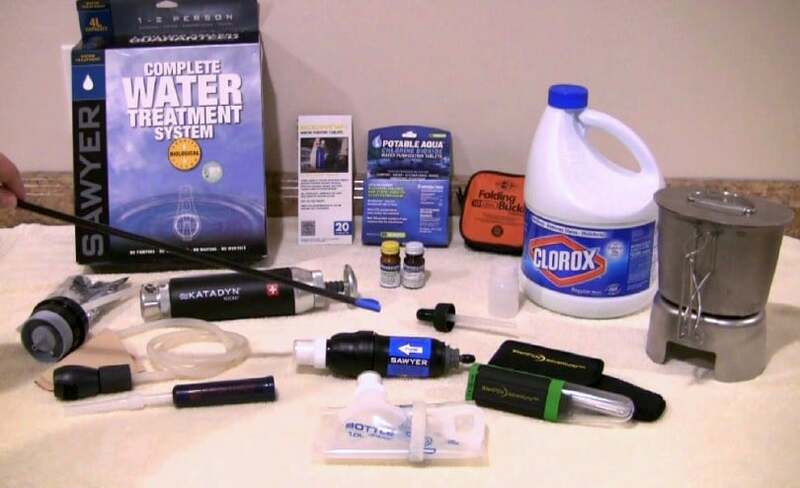 Some experienced and professional survivalists recommend filtering the water before you treat it with any tablets, since some organisms or bacteria live within impurities, organic particles, etc. and this natural dirt protects them against the chemicals. So, if you first filter the water, you will be sure to leave the water clear of particles and it would be much quicker to purify it further by using tablets. In addition, most tablets remove and neutralize metals and other minerals. If you combine boiling the water with the above treatment you will have even cleaner water. You don’t have to keep the water boiling for the recommended 10 minutes. Only one minute would be enough. In addition, this will raise the water temperature and the purifying tablets will work quicker. If you want to learn more about how to boil the water properly and read about other purification methods, please visit our article on how to purify water. After boiling the water, filter it using a filtering or purifying system and then drop a purifying tablet. This combination will render the water ideal for drinking as there will be no dirt, viruses and other contaminants left. If you don’t have a filtering system at hand you can always make one using the items around – to learn more about this, check out our tutorial on how to make a water filter. And it will work as quickly as 30 minutes. As we mentioned above Cryptosporidium cysts take the longest to neutralize, but they can be killed within 30 minutes if the water is above 20 degrees C. So, if you boil the water before any treatment, you will be sure to increase the purifying process and drastically reduce waiting times. Finally, when you treat your water will these tablets, keep in mind that most of them within 40 hours will have a compromised effect. 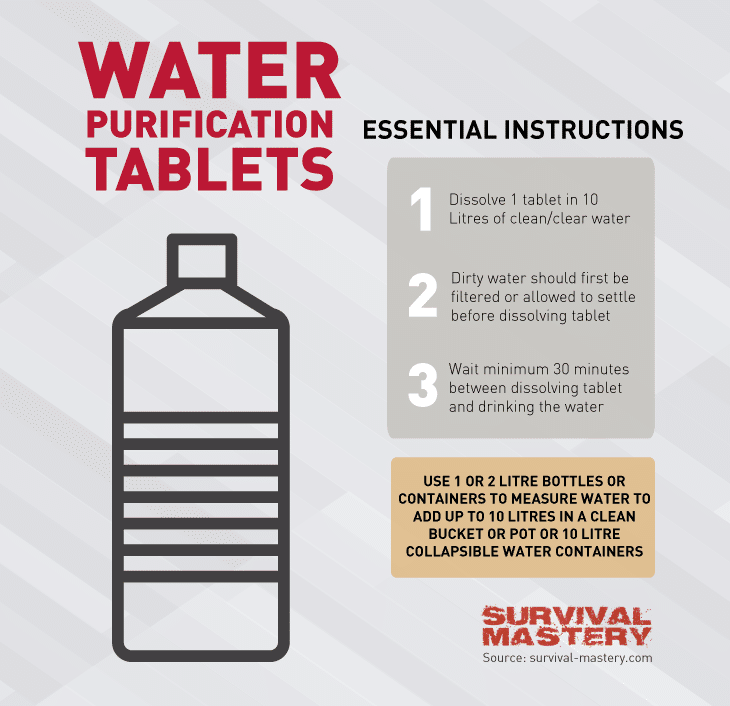 This means that if you use a tablet now and let the water stay for more than 40 hours, after that the water may get contaminated again, as some bacteria will have the chance to reproduce. So, you are advised to use the tablets appropriately within reasonable amount of time. Drink the treated water no later than 24 hours. Also, chlorine, upon long contact with UV light, dissipates and thus the water’s purity will be compromised. You may think that you can treat the water now and leave it for later use but professional advice against this method. Do not delay the consumption of the treated water even if that means waiting 4 hours for it to be purified.